For other uses, see Rosales (disambiguation). Rosales is an order of flowering plants. It is sister to a clade consisting of Fagales and Cucurbitales. It contains about 7700 species, distributed into about 260 genera. Rosales comprise nine families, the type family being the rose family, Rosaceae. The largest of these families are Rosaceae (90/2500) and Urticaceae (54/2600). The order Rosales is divided into three clades that have never been assigned a taxonomic rank. 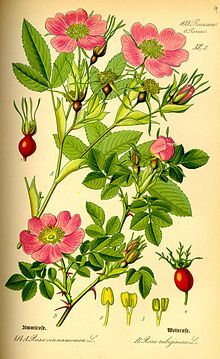 The basal clade consists of the family Rosaceae; another clade consists of four families, including Rhamnaceae; and the third clade consists of the four urticalean families. The order Rosales is strongly supported as monophyletic in phylogenetic analyses of DNA sequences, such as those carried out by members of the Angiosperm Phylogeny Group. In their APG III system of plant classification, they defined Rosales as consisting of the nine families listed in the box on the right. The relationships of these families were uncertain until 2011, when they were resolved in a molecular phylogenetic study based on two nuclear genes and ten chloroplast genes. Well-known members of Rosales include: roses, strawberries, blackberries and raspberries, apples and pears, plums, peaches and apricots, almonds, rowan and hawthorn, jujube, elms, banyans, figs, mulberries, breadfruit, nettles, hops, and cannabis. The following phylogenetic tree is from a cladistic analysis of DNA that was published in 2011. Rosales is an order that falls under the kingdom of Plantae. This chart below shows the classification in order to get to the order Rosales. Within the Rosales order is the Rosaceae family, which includes numerous species that are cultivated for their fruit, making this one of the most economically important families of plants. Fruit produced by members of this family include apples, pears, plums, peaches, cherries, almonds, strawberries, blackberries, raspberries, breadfruit, and jackfruit. The leaves of the mulberry provide food for the silkworms used in commercial silk production. Many ornamental species of plant are also in the Rosaceae family, including the rose after which the family and order were named. The rose, considered a symbol of love in many cultures, is featured prominently in poetry and literature. Modern garden varieties of roses such as hybrid teas, floribunda, and grandifora, originated from complex hybrids of several separate wild species native to different regions throughout the world. The wood from the black cherry (Prunus serotina) and sweet cherry (P. avium) is used to make high quality furniture due to its color and ability to be warped. Plants in the Rosales order were used in the traditional medicines of many cultures. The latex of some species of fig trees contain the enzyme ficin which is effective in killing roundworms that infect the intestinal tracts of animals. ^ a b c Angiosperm Phylogeny Group (2009). “An update of the Angiosperm Phylogeny Group classification for the orders and families of flowering plants: APG III”. Botanical Journal of the Linnean Society. 161 (2): 105–121. doi:10.1111/j.1095-8339.2009.00996.x. Archived from the original (PDF) on 2017-05-25. Retrieved 2013-07-06. ^ UniProt. “Order Rosales“. Retrieved 2008-04-24. ^ a b Shu-dong Zhang, De-zhu Li; Soltis, Douglas E.; Yang, Yang; Ting-shuang, Yi (July 2011). “Multi-gene analysis provides a well-supported phylogeny of Rosales”. Molecular Phylogenetics and Evolution. 60 (1): 21–28. doi:10.1016/j.ympev.2011.04.008. PMID 21540119. ^ “Classification | USDA PLANTS”. plants.usda.gov. Retrieved 2018-10-22. ^ “Rosales | plant order”. Encyclopedia Britannica. Retrieved 2018-10-22. ^ a b W., Chase, Mark. “Rosales”. AccessScience. doi:10.1036/1097-8542.593700. Retrieved 2018-10-22. ^ a b c d “Rosales | plant order”. Encyclopedia Britannica. Retrieved 2018-10-22. “Rosales”. Integrated Taxonomic Information System. Retrieved 24 April 2008.